Quilt blocks that were pieced and then layered, quilted and bound where often sewn by groups of mid-nineteenth century women into community service quilts. Today we refer to these quilts as 'pot holder quilts'. Shortly after the beginning of the War, the attack on Fort Sumter April 12, 1861, President Lincoln signed the legislation for the United States Sanitary Commission. The Commission's initial purpose(based on a British model from the Crimean War) was to work for better field and hospital conditions for the soldiers. America's 'industrial war complex' of the time was primitive and unprepared for the rapid call up of fighting men (75,000 militia) by President Lincoln. In especially short supply were articles of clothing and bedding. A call for quilts or comforts was issued by the Commission. The size requested was '8 feet long, 4 feet wide'--a good size for hospital cots and soldiers' backpacks. The quilts donated were usually stamped with an oval containing the words "Sanitary Commission". It is estimated that Northern women made and donated more than 250,000 quilts. Many quilts were used as shrouds; others were burned when a field hospital was moved. There are only 6 known survivors. Three are pot holder style: Rally Round the Flag, the Hingham, Mass quilt and the 6th which was seen in 1998 in Texas and is called the 'Long quilt'). Don Beld has developed patterns for 4 of these quilts. His latest pattern is a 4 block wallhanging done in the Pot Holder technique. In January, 2010, he will have a new pattern with all 13 different blocks (including the block featured above) of the 5th Sanitary Commission quilt from Hingham, MA. Calico Trade Shirts on the Journey of Discovery with Lewis and Clark, a paper I wrote for the Costume Society of America required some fascinating primary document research. I spent many hours reading 1803 issues of a Philadelphia newspaper, Poulson's American Daily Advertiser. On a fine Wednesday afternoon, at the corner of 3rd and Main St, one trunk superfine chintz and one trunk Furniture chintz was up for auction. How I would loved to have been there! On second thought, maybe that would give me a different number at my upcoming January birthday? Trade shirt pattern (above image), is # WID-1 from the Smoke & Fire Company. Fabrics recommended by the company are bright cotton cloth in florals, checked or stripes. This picture was taken by Nettie Monroe at my "Furs on a Stick" lecture at the Textile Center in Minneapolis. 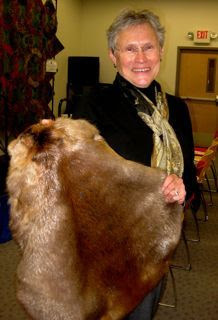 I am holding a beaver pelt that I use for a visual aid in my lecture on Fur Trade Era textiles. For the lecture, I had handed out fabric sample packets. They included the wonderful yellow print below that I thought was very appropriate for voyageur's shirts. 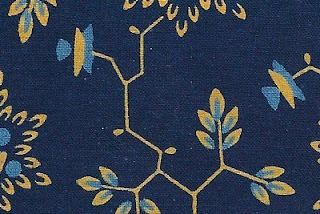 To my delight, when I returned to my store, there was an online order from the costume shop at the Fort William Historical Park in Thunder Bay, Canada that came in while I was lecturing -- they had ordered the same yellow print! It will be sewn into a shirt this winter to be worn by a site interpreter next summer. 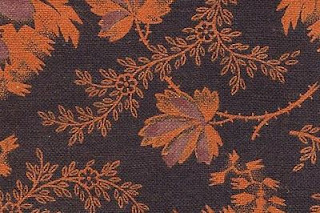 These fabric samples are from my c. 1830 Dargate book and illustrate other illuminations. 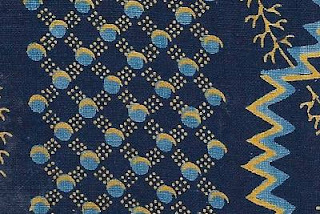 The following two pictures are examples of Two Blues with chrome yellow. 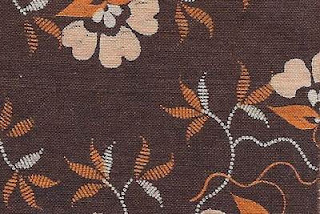 Below are examples of chrome orange on brown.